"I received my notecards on Saturday and I can't begin to tell you just how much I enjoy just looking at the flowers. I had to sit right down and send a note to my best friend just to share the picture with her." 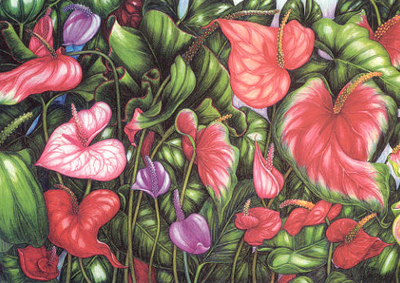 Teri Inouye's painstaking depiction of the anthurium's blossoms and leaves is like a performance of hula dancers. Sinuous, colorful and strong, these anthuriums dance before your eyes -- and represent both the male and female properties of this exotic plant -- and of the hula. "Received the package of cards and they are fantastic! Thank you!" "Thanks again for the cards and for an all around pleasant experience. It's so nice to deal with real people in this age of computerized responses. I'll recommend you to all my family and friends." SCM-ANTHJ2 Double Matted Note Card $13.50 Click here for ordering information (write in the comments section the name of the card you would like). SCK-ANTHJ2 Double Matted Note Card framed in Koa $40 Click here for ordering information (write in the comments section the name of the card you would like). GIC-ANTHJ2 20" x 11" Giclee Print $400 Click here for ordering information. GICK-ANTHJ2 27 1/2" x 18 1/2" Giclee Print Framed in Koa $550 Click here for ordering information.